Because there can be so many different ways to visualize your data, it helps to have a basic guideline to follow. One of the most common issues when creating a visualization is not understanding the best ways to display your data. Especially if you are just getting started creating charts or if you have existing data sets that you seek to visualize. It’s natural for me to see a data set or a have a goal in mind and know which chart to rely on, but if you are just beginning to visualize your data, basic mistakes are quite common. 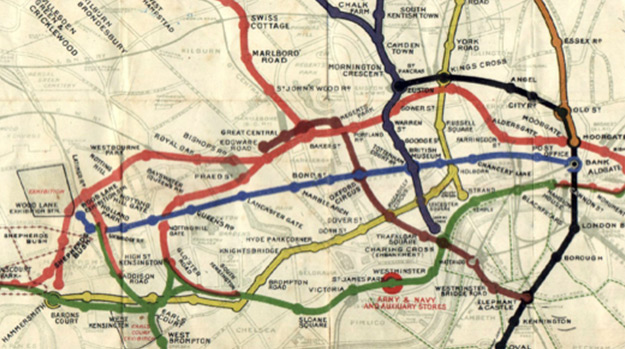 One famous example of data visualization that did not achieve its purpose is this 1908 London Underground pocket map. As you can see, this map showed the Tube stations in relation to landmarks and streets above ground in London but navigation was a problem if you wanted to do something as simple as change from one line to another. 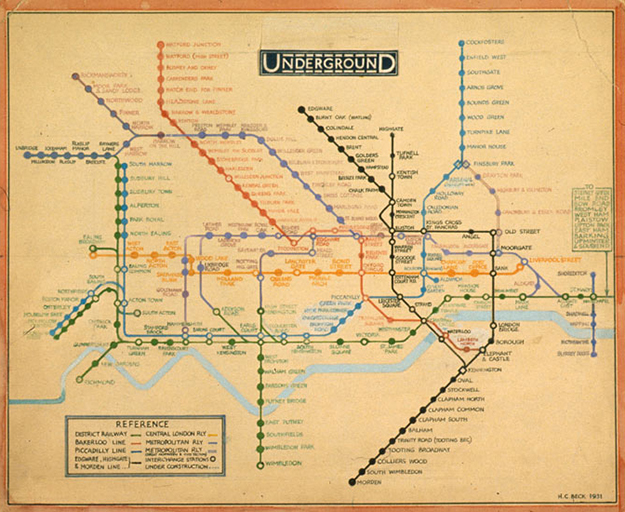 In 1931, Henry Beck, engineering draftsman with the London Underground’s Signals Office came up with a more effective way to visualize the same information: a diagrammatic map (see below). With this new map, travelers could easily count their number of stops, changes and navigate which line would get them to their destination in the fewest stops. As you can see, the same data can be displayed in more than one way – it all depends on your purpose and what you are looking to show your audience. There can be so many different ways to visualize your data, it helps to have a basic guideline to follow. Because there can be so many different ways to visualize your data, it helps to have a basic guideline to follow, which can be found in this great flow chart produced by Dr. Andrew Abela, Chairman of the Department of Business & Economics at the Catholic University of America in Washington, DC. With Dr. Abela’s permission, I have prepared a similar chart with a few additions of my own. 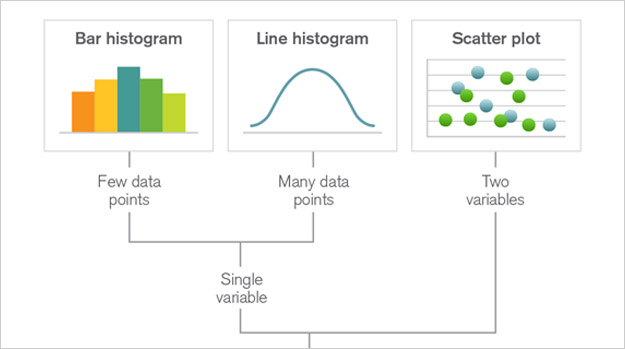 This graphic breaks down the most basic usage elements of any visualization (Comparison, Distribution, Composition, and Relationship) and it allows you to follow a clearer path to map your data to the right visualization. It might not be a PhD course, but it’s a good starting point! Taking a closer look at this graphic, there are many charts that we could add to what you already see (slope graph, distribution plot, lollipop chart and many others). But for the beginners looking at the illustration I wanted to ensure it was not confusing. In future blog posts, we can dive deeper into the strengths and weaknesses of these charts and other potential charts you can use to display your data. I am planning to cover what I consider to be the Three Pillars of Mapping Data to Visualizations in greater depth. Those Three Pillars would be Data Attributes, Visual Encoding and the focus of this post: Usage. Stay tuned for more posts from me soon. Click here to download our complete guide to visualization and discover new methods to map your data to visualizations!